Recent studies have used the metabolomic approach to generate preliminary evidence of specific metabolites that can distinguish lean and obese individuals. Specifically, plasma branched chain amino acids (BCAAs) were differentially present among obese and lean adults [4–6]. Furthermore, circulating acylcarnitines were shown to differ between obese and lean individuals and between diabetic and non-diabetic subjects . The observed association was linked to a mitochondrial dysfunction, hindering effective transfer of cellular energy . In addition to BCAAs and acylcarnitines, levels of phospholipids were also reported to be higher in obese compared to normal-weight individuals. This phenomenon was postulated to be due to decreasing β-oxidation of fatty acids leading to lipid accumulation . Prior studies of metabolomic biomarkers in obesity have largely focused on a particular group of compounds rather than assessing a large number of metabolites at the same time [14–20]. However, emerging evidence suggests that not only metabolites’ absolute levels, but also metabolite relationships play a role in the biology of metabolism . Therefore, it is crucial to simultaneously investigate a larger number of metabolites to arrive at a more accurate etiologic picture. Another important feature of metabolomics studies is the approach to measurements, with discrepant methods sometimes yielding inconsistent results. For example, using a different targeted metabolomic approach (electrospray ionization (ESI) tandem mass spectrometry) compared to ours (liquid chromatography coupled to triple quadrupole mass spectrometry(LC-MS/MS)), Oberbach et al. reported a cluster of dissimilar amino acids and polar lipids compared to our findings. Consistent with prior findings, we observed strong associations between BCAAs and obesity. Earlier, Jourdan et al. reported that levels of BCAAs were higher in individuals with higher BMI . Moreover, BCAAs and aromatic amino acids have previously been proposed as biomarkers of metabolic syndrome . Amino acids can be converted to one of seven metabolites: pyruvate, a-ketoglutarate, succinyl- Coenzyme A (CoA), fumarate, oxaloacetate, acetyl CoA, or acetoacetate. 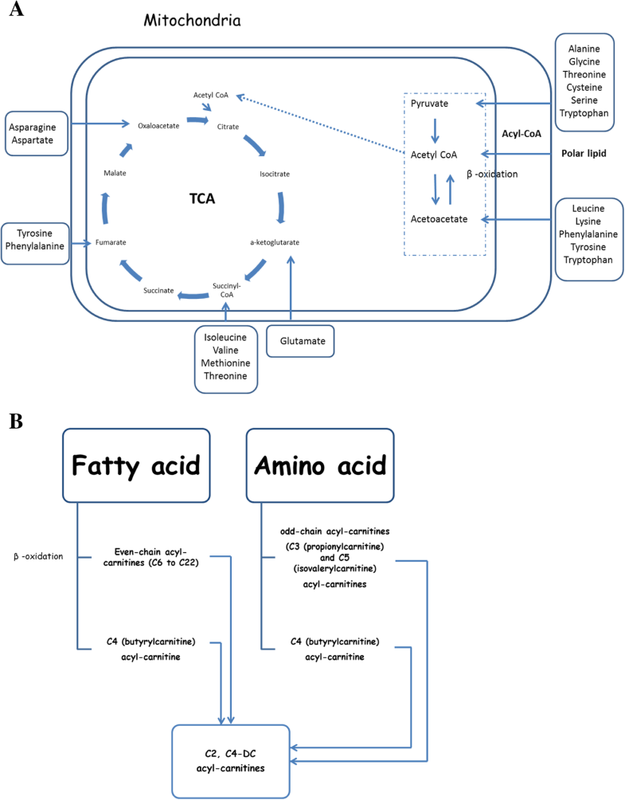 These metabolites are further degraded by the tricarboxylic acid cycle (TCA cycle) and oxidative phosphorylation  (Fig. 2a). The metabolites of amino acid (including BCAA) breakdown in a high catabolic rate are odd-chain acyl-carnitines such as C3 or propionylcarnitine and C5 or isovalerylcarnitine, while C4 or butyrylcarnitine is produced in both amino acid and fatty acid catabolism  (Fig. 2b). Apart from changes in amino acid degradation, elevated levels of BCAAs and other amino acids such as alanine, glutamic acids, proline, and tyrosine may be due to the activation of the mammalian target of rapamycin complex1 (mTORC1) or impaired protein expression [27–29]. 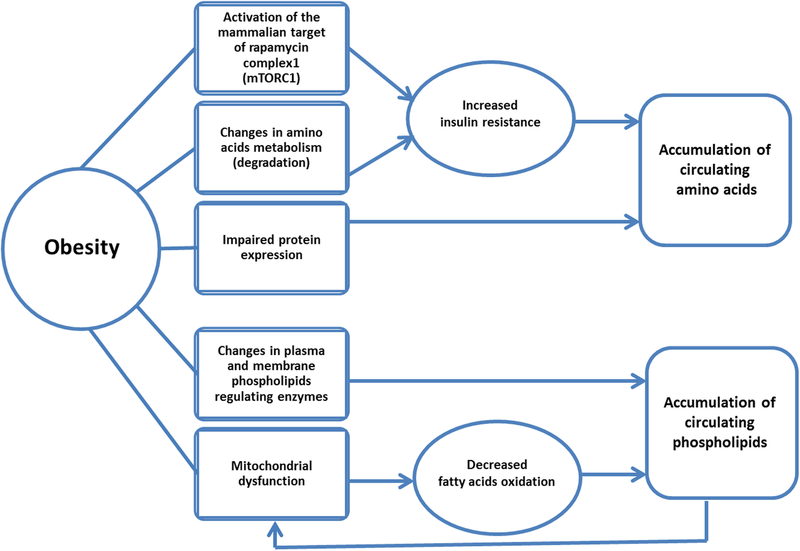 Both protein degradation and activation of mTORC1 can lead to insulin resistance, which in turn can cause greater levels of circulating amino acids in obese patients [27, 28]. Also, the cellular transportation of BCAAs and the large neutral amino acids may be influenced by obesity-associated impairment in the expression of the LAT1 protein  (Fig. 3). Regarding previous literature it is not clear if the identified metabolites are unique to Iranian population. However, there are gender and age-associated differences in metabolite profiles in various population groups [37, 38]. Therefore, beyond alterations in metabolomic approaches, any observed discrepancies in findings might be due to differences in the research population (in the study by Oberbach et al. , only men were included while in ours, we recruited both men and women). Furthermore, changes in diet and physical activity altered amino acid and phospholipid metabolisms [39–41]. However, according to our findings, there was not any significant association between metabolites and energy intake or physical activity after Bonferroni correction. Regarding diet composition, recent research revealed that changes in macronutrient intake can influence lipid and fatty acid chain in acylcarnitines . But in our study although we measured acylcarnitines, we did not observe a significant difference, with respect to this group of lipid species, between cases and controls. Therefore, we concluded that the increased carbohydrate intake in the obese population might not contribute to the increased levels of any of the identified obesity-related metabolites.